Semtech Corporation (Nasdaq: SMTC), a leading supplier of analog and mixed-signal semiconductors, today announced that Nigel Seth-Smith, Manager of Strategic Technology for Semtech’s Signal Integrity Product Group, will be discussing the challenges associated with implementing next-generation UHDTV infrastructures at the Society of Motion Picture and Television Engineers® (SMPTE®) UK Section’s day-long seminar titled “Real-Time Media Transport — From SDI to Hybrid to Full IP” in London on Feb. 11. Semtech is an industry leader in high speed signal integrity solutions for both the broadcast (UHD-SDI) and datacom (10GbE, 40GbE and 100GbE) markets, and is actively involved in international standardization of next generation interface technologies in both SMPTE, and the IEEE. As such, Semtech is uniquely placed to provide technology insight from both sides of the real time media transport debate. 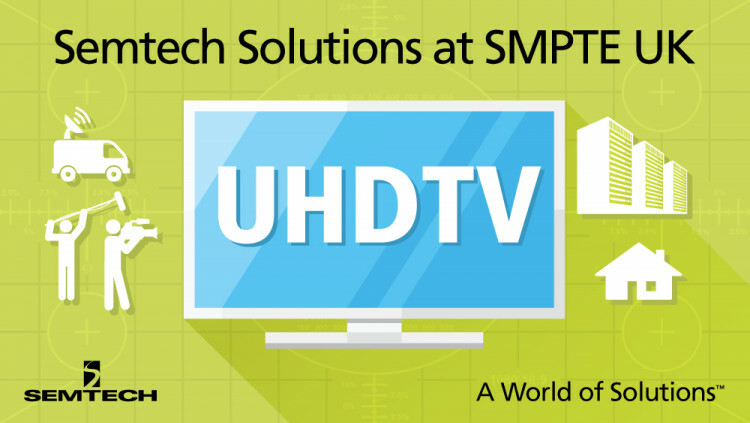 This SMPTE UK Section seminar will feature a broad cross section of industry experts, challenging common assumptions associated with implementing next-generation UHDTV infrastructures and providing an in-depth analysis and status update of proposed solutions. Re-established in 2012, the SMPTE® United Kingdom (UK) Section has seen a high degree of interest and support from individuals and companies throughout creative, manufacturing, broadcasting, and service organizations. The Section holds regular meetings across the UK and each month in London, providing ample refreshments, time to network, and opportunities to explore a wide range of topics with industry experts. The Section also holds an annual one-day seminar. The popularity of the Section led to the creation of the SMPTE UK Region this year, which provides the Section with formal representation on the SMPTE Board of Governors. All statements contained herein that are not statements of historical fact, including statements that use the words ”will,” “aimed,” ”enables.” “meets,” “offers” or “to design,” or other similar words or expressions, that describe Semtech Corporation’s or its management’s future plans, objectives or goals are “forward-looking statements” and are made pursuant to the Safe-Harbor provisions of the Private Securities Litigation Reform Act of 1995, as amended. Such forward-looking statements involve known and unknown risks, uncertainties and other factors that could cause the actual results of Semtech Corporation to be materially different from the historical results and/or from any future results or outcomes expressed or implied by such forward-looking statements. Such factors are further addressed in Semtech Corporation’s annual and quarterly reports, and in other documents or reports, filed with the Securities and Exchange Commission (www.sec.gov) including, without limitation, information under the captions “Management's Discussion and Analysis of Financial Condition and Results of Operations” and “Risk Factors”. Semtech Corporation assumes no obligation to update any forward-looking statements in order to reflect events or circumstances that may arise after the date of this release, except as required by law.